0N grazing properties generally, compaction of the soil has developedfrom the tramping of stock. This tends to limit the pore space and the free movementof oxygen in the soil. These soils change as distinct zones are formed by compactedhorizons below the shallow grass root depth. The natural movements throughout thewhole of the soil becomes more restricted, less deep mineral material finds its wayto the topsoil to replenish it, and the soil gradually becomes impoverished of bothhumus and minerals. An unnatural division of the soil into layers is made. Only theshallow top soil, with its rapidly diminishing minerals, is available. Good grass species tend to run out, as the whole pasture deteriorates;less rain is absorbed; soil losses may occur; valleys become too moist and sour orthey erode; hills become dryer and less productive. This pasture now needs two things that it has lost and which can besupplied by proper cultivation, enabling its processes to be stimulated again. Theyare air and water; or simply absorption capacity which will enable the soil to absorband hold the rain that falls on it. Although the soil cannot be put back in perfectcondition in one operation, it can be progressively improved to a condition usuallybetter than it was originally. Single working Keyline cultivation with a depth of penetration justthrough the top soil into the compacted zone is a logical first means to supply boththe air and moisture required. Excellent results will follow this work completedin the autumn. Another suitable time is probably a few weeks before each locality'sbest rainfall season. Spike or chisel furrows 12 inches apart and at the depth previouslysuggested, break or crack the continuous horizon of compacted material that now dividesthe full depth of this soil. With aeration and quick moisture penetration the wholenessor completeness of all the soil's depths is brought back progressively. The decayof dead and dying root growth again adds rapidly to soil fertility by the formationof humus below the pasture. Some pasture grass is destroyed in this process by being uprooted,and further pasture becomes temporarily unavailable to stock by being partly clodand sod covered. Within a very short period a much improved pasture, both in qualityand quantity, is again available. The soil is coming to life again. It may be appropriate at this time also to introduce new species ofclover or grasses to assist the development further. The use of lime or fertiliseris often of considerable advantage in commencing a new cycle of fertility in thepoor soils. It is often highly profitable to conduct a two- or three-year planfor the improvement of a very poor soil paddock. First Year.--One Keyline cultivation working approximately	4-1/2 inches deep with spike spacing 12 inches apart is given in the autumn. Second Year.--Another Keyline cultivation working five to seven	inches deep with spike spacing 24 inches apart. Third Year.--A further Keyline cultivation working seven to	ten inches deep with spike spacing 36 inches apart. Stock is moved off the area immediately prior to each Keyline cultivationworking and not returned until some weeks after the first rain has fallen on thearea. The clods quickly become improved in structure and are partly distributedby the stock over the surface, thus forming a valuable top-dressing to promote furtherabsorption, decay and fertility. Careful stocking of this treated pasture can makeit still more effective. Soils so treated are in a perfect condition, especiallyif frosts have operated on the clods, for rapid response to all other means of increasingsoil fertility and yield. Rotational grazing, strip grazing and smear harrow treatment, by greatlyincreasing the effectiveness of the use of the fertility potential of the animaldroppings, are outstanding in their fertility effect on this treated soil. By this means poor shallow soils will not only become more fertile,but will be converted profitably into areas of considerably increased soil depth. If the depth of fertile soil is doubled, the profit margin is increasedmany times. The aim of progressive development by progressive increase in penetrationdepths for maximum absorption-fertility is of outstanding importance. February pasture on Nevallan" (not irrigated). In the picture with meis Ginger, one of our pets. Ginger was badly burned in the bush fire on "Yobarnie"in 1944. Pasture--lucerne, rhodes, clovers, cocksfood-is under two years old. The drastic deep ripping or subsoiling of pastures on the poorer thinsoils, while probably increasing first year yield, will all too often be disappointingin yield for following years. Deep ripping with rigid implements is very costly andthrows up clods which are too big. Heavy soil will not remain open to this depthbut will reseal with the first good rain. There is no profit in taking depth thatcannot be held. The topsoil fertility will fail to produce a rapid soil change inthe subsoil if it is given too much depth of subsoil to "convert". Againconsider the topsoil as a yeast and do not subject it to too great a dilution--asmay take place in the case of overall deep ripping or subsoiling. The present methods of subsoiling crop land, where deep sub-soilersrip the soil to 24 inches deep, and surface cultivating implements follow, is wrong.The fine surface cultivation of deep subsoiling largely offsets the benefits of themoisture and air absorption capacity of the subsoiling. All the benefits of subsoiling,without its usual disadvantages and high cost, are obtained in the final deeper runof Keyline cultivation. Extra depth can be obtained by increasing the cultivatingrow spaces. The object of Keyline cultivating below the soil into the subsoilis always the improvement of soil fertility and the conversion of this subsoil intomore fertile soil. It can be done most profitably and economically only as a progressiveprocess. Compacted soils of all types have lost the natural fertility potentialthat is available to all soils of good structure. The continuous decay and humusformation from the considerable amount of grass roots material which dies each yearis almost entirely wasted. Poor compacted pasture land usually has available to it every ingredientfor a rapid fertility increase except oxygen and water, and these two are preventedfrom operating fully. Minerals of all necessary kinds are usually only inches below thepoor pasture. The urine and dung of the animals are available in sufficient quantity.Materials for aerobic decay and humus formation exist in the grass roots, all ofwhich have not been completely lost. One low cost fast run with spikes or chisels on the Keyline principlemakes available all the ingredients for a new fertility. Within a few weeks afterrain on this cultivation, the return of life to the soil and pasture can be seenin the rapidly changing structure of the soil. Whenever pasture land shows sign of surface sealing or compactionit should be treated in this way. If and when the second cultivation is requiredit is made deeper. The same high speed and low cost is obtained by increasing thespike or chisel row spacings. Actual soil depth is increased this way. On the slopes below "Nevallan" Homestead. "Keyline Cultivation"for soil and pasteure improtement a few days after the first shower of rain. Thearea shown in the lower half of the picture was originally pasture sown on shallowdisking. After this one Keyline cultivation, pasture growth improved fourfold. As soil becomes more and more fertile, less and less aeration by cultivationis necessary. Reasonably well managed highly fertile soil will look after itself.It will absorb all the available factors of fertility and aerate itself. It willpreserve its own "life", including the beneficial earthworms. Fertile soil and pasture absorb moisture rapidly, store it deeplyand the soil aerates itself. Other plant nutrient as well as oxygen and water reach the earth inthe rainfall. These are largely absorbed into the soil and held if the soil is properlytreated. When poor pasture land is to be completely cultivated to kill allgrowth for the replanting of a new pasture, it is treated as described for conversionyear cultivation. Grass seeds are sown into this cultivation with outstanding resultsby seeding with an ordinary grain combine with the cultivating tines removed. Foreven sowing and better germination, a flow medium of some kind mixed with the grassseed is a great advantage. Sow into the moisture zone some time after rain has fallen. If the soil is of poor structure--low in humus--watch it against possiblesurface sealing after heavy rain. If it seals give it one working when it is dryenough. Follow the Keyline cultivation with spike spacings 24 inches apart. If pasture tends to run out something is definitely wrong. Apart fromoverstocking or indifferent stocking management, the cause will be moisture wastage--shortageof oxygen--or both. If pasture land is assisted by correct cultivation to absorbmoisture and air it will continue to improve in fertility and productiveness andwill not run out. To-day most pastures tend to deteriorate, and these declining pasturesare ploughed up, a crop or two taken and re-sown again to grass and legumes. Thepoorest pasture paddock is usually selected to be used in this way. If crops are to be taken on pasture land only good pastures shouldbe used. Any farmer would be reluctant now to take this course, but if allhis pastures were good, he may select his best pasture paddock for cropping. Anythree-year-old pasture should be good, and improving. 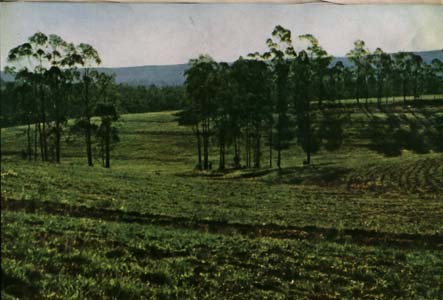 The newly sown pasture willprobably be the lowest yielding, but will be improving rapidly with the soil fertility.The farmer will select his best soil and pasture for his crops and so allow timefor his newer and poorer pasture to improve with the soil before they in turn comeup for cropping. Some pastures may need Keyline cultivation for fertility by absorptioneach year for two years, and need the treatment again in three years, then five ormore years later. As both the soil and pasture improve, better grasses may be introducedwith any Keyline cultivation. An improving soil will more truly indicate its requirements in mineralsor trace elements--should these be necessary--than a soil that is being forced toyield by one or more of the popular methods of extractionfertility. 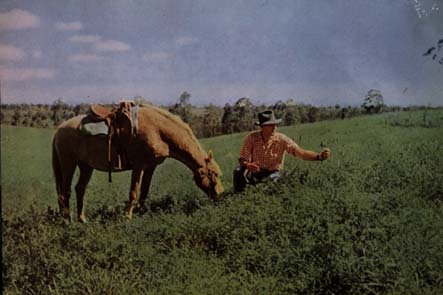 There are numerous methods and techniques for pasture improvement,some good, some very bad. Pasture improvement can be obtained--temporarily at least--by moreefficient methods of extracting the remaining fertility of the soil. It can be securedproperly and permanently only by methods that primarily improve soil structure, fertilityand depth. It is wrong to use chemical fertilisers only to improve pastures. A fertiliser,if used, should be used in such a way as directly to improve the soil. This improvedsoil will give an improved pasture, thus commencing a cycle of soil fertility, permanentlyimproving pastures. If fertilisers cannot be used on soil apparently requiring them toassist directly in "triggering-off" this new cycle of soil fertility, thesoil is much better off without the fertiliser. Soils that do require the use of fertiliser also usually need, andmuch more urgently, the application of the principles of absorption-fertility. If the soil is very low in humus, the first full green growth on thissoil should be plowed into it. This will start the cycles of fertility and increasingyields. Fertilise to improve soil and depend on improved soil only for increasedyields. The recent enthusiasm for pasture improvement in Australia has unfortunatelyemphasised the wrong word. "Soil improvement" is the only real basis forlong-term pasture improvement. It is more than likely, indeed almost certain, that the introductionof new grasses and fertiliser to increase rapidly the stock-carrying capacity ofpoor soil, is providing the farmer with another method of extracting the fertilityof the soil. The soil must always be considered first. Increase absorption, manufacture--humusunder the pasture, improve the structure of the soil, increase soil "life",then the improved grasses will readily assist in the full development of soil fertilityand produce abundant pastures. It is fully recognised, however, that some methods and techniqueshave produced outstanding pastures. Disc implements have on occasions been used exclusively, and haveimproved soil and pasture on soil that had lost its condition and some of its fertility.The shallow disc plowing into the soil of crops of weeds and later sowing pasturegrasses by the methods of broadcasting or "direct-drop" and then harrowing,may give an outstanding pasture for a few years. By improving top soil fertility, actual improvement of soil depthmay take place very slowly, but the pastures tend to "run-out". Such pasture treated by the Keyline method for soil and pasture improvementwill produce rapid and permanent soil and pasture improvement. Very fertile soils on occasions require Keyline cultivation. After big floods recede from farming and grazing land there is usuallystriking evidence of the damage caused to the soil by waterlogging. The soil hasbeen partly killed by too much water. It is literally "dying-for-air".Pastures which grow out of this soil are not healthy stock food, although the grassmay be growing well. It is the type of food suitable for the hordes of pests thatfeed on the products of infertile or "sour" soils. These pests locate thisfood and devour it as they breed in countless millions. They may "foul"the soil to such an extent that stock will not graze what may remain. With the infestation,weeds often grow in profusion. This soil needs Keyline aeration cultivation immediately it is dryenough. The "sickness' is then cured and the soil will be almost immune to thesepests. A fast working of the land with tines spaced at 12 or 24 inches apart at adepth of four to five inches is all that may be necessary to bring this soil backto a healthy state. Deeper cultivation depth on the wider spacing could be considered. Disc implements and mouldboard plows are not recommended because theyare unsuitable for following the lines of Keyline cultivation. They do not promoterapid soil improvement and are incapable of the correct deeper cultivation. Mixed growths of vine and rough grass may be given one shallow runwith a disc implement and immediately followed with the spiked implements. Keylinecultivation must always be followed. An outstanding pair of implements for soil improvement particularlywhere the growth is heavy and matted, is the Mulch Mower and the Graham Plow. The Mulch Mower can be used also to the great benefit of the soilany time pasture growth is high and not required for immediate stocking or fodderconservation.